New Generation Hostel Santa Maria Maggiore i Rom, Italien : Boka nu! 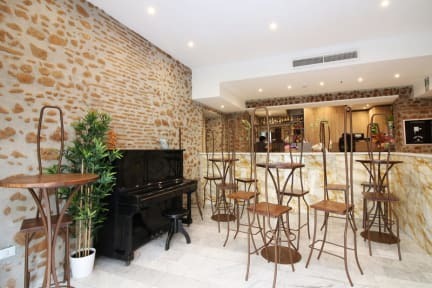 New Generation Hostel Santa Maria Maggiore has an inside garden, bar-restaurant, fully furnished kitchen for guests use. 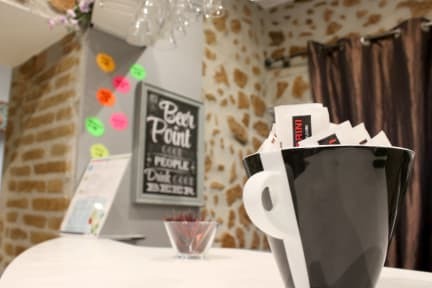 The Hostel offers to the guests all the amenities of comfort and such as daily cleaning , free WIFI throughout the hotel , socialization and relax areas. New Generation Hostel Santa Maria Maggiore is located in Via Dei Quattro Cantoni 35, near the Church Santa Maria Maggiore (one of the Holy Doors of the Giubileum), close to the Colosseum (served by the subway), the Imperial Forums (Fori Imperiali) and not far from Termini Railway Station. In all the rooms there are private lockers with electric socket, each bed has bedside table, light and electric socket, orthopedic mattresses, fridge and table. Jätte fräscht och snyggt vandrarhem som känndes mer som ett hotell fast med fler sängar!